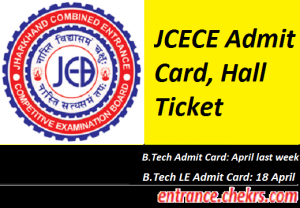 JCECE Admit Card (जेसीईसीई प्रवेश पत्र) 2017: Candidates those have applied for JCECE 2017 are informed that the JCECE B.Tech admission test 2017 will be conducted on 07th May and for B.Tech Lateral Entry entrance exam on 30th April 2017. Candidates will be able to download the JCECE B.Tech Admit Card 2017 in the last week of April 2017. It is necessary for all the candidates to carry the JCECE Hall Ticket 2017 hard copy along with a valid photo ID proof in the examination hall while appearing in the exam. JCECE B.Tech Lateral Entry Hall Ticket 2017 will be released on 18th April 2017. Candidates are advised to follow the step wise procedure given below to download the JCECE Call Letter 2017. Its a great news for all those candidates who are going appear in the entrance exam, they will be able to download the JCECE Exam Call Letter 2017 from the last week of April for B.Tech regular entry and from 18th April for B.Tech lateral entry entrance exam. Candidates have to carry the exam hall ticket hard copy with them while appearing in the exam, without the JCECE Hall Ticket 2017, the aspirants will not be allowed to appear in the examination hall. Visit the official site of JCECEB, i.e. jceceb.jharkhand.gov.in/. Check the admit card link in the notification section and open it. Fill the required info such as- Roll no and DOB. Download admit Card and Take a copy for exam time use. The exam hall ticket will be provided only for those candidates who have applied for JCECE 2017 successfully before the last date. The JCECE Admit Card 2017 will be released in the last week of April 2017 for B.tech regular admissions and for B.Tech lateral entry it will be released on 18th April 2017. Candidates will be invited to appear in the examination along with the BCECE Hall Ticket 2017 on 07th May and 30th April 2017 for JCECE B.Tech regular and lateral entrance exams respectively. For any type of assistance, while downloading the JCECE B.Tech Admit Card 2017, you can contact us by commenting at the end of the post.